Are you new to homeschooling or feeling stuck about starting a new year? 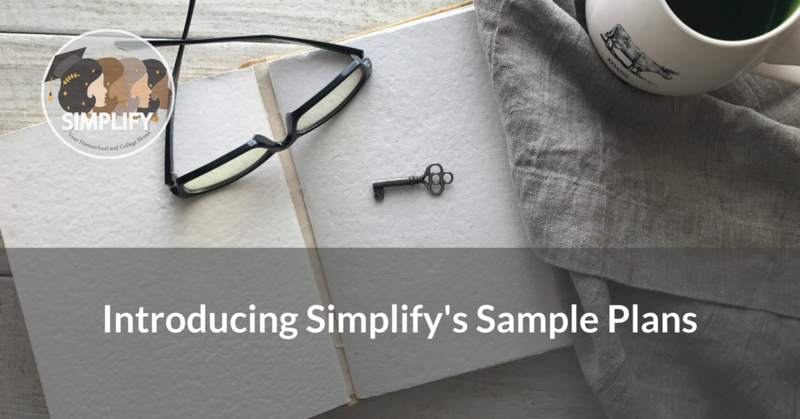 Below are the links to Simplify’s Sample Plans for each level of homeschooling. You can also find them permanently on our resources page. These are generalized plans because individual students and families have individual needs. We’re all hoping to provide the best education possible for our kids, to challenge them appropriately, and to inspire them to become lifelong learners. However, not only can no one program do that for all kids, but also no one approach can do it either. That’s why these generalized plans try to recognize the differences between different types of kids. Even within different types of students, there can be differences. There’s no one math program that’s right for the STEM interested student and no one writing program right for the creative student. While all students will likely need core subjects like math and writing, the time to start a foreign language, whether or not to formally study art, and how much time to spend on content subjects like science and history, can vary from student to student. Some kids just need to be finished with school and have time for their own pursuits. Others need you to help plan rich projects and creative challenges for them. We encourage you to be responsive to your students. One thing that’s not covered on these plans is specific state requirements, such as state history, health, or P.E. Be sure to check your state laws. But also remember that a requirement doesn’t mean you necessarily need to buy anything. PE can be documented through photos of outdoor time. Health is something you’re hopefully already covering through regular parenting interactions. State history can be done through field trips or other means. I hope these are useful as a starting point for you! If you need more guidance, reach out to us and we can help you flesh these out into the right year for your child. Previous StoryWhat’s Up With Simplify? Next StoryHelp! My Gifted Child Does Not Fit Anywhere!